For its fifth generation, the Prologo Jersey from Castelli continues in its pursuit of being your favorite jersey. From the comfortable and relaxed fit that keeps you cool and dry during those long spring and summer rides, to its simple minimal design that won’t clash with any kit, it’s not hard to see why Castelli keeps investing in this piece. This jersey is more comfortable than ever, thanks to the redesigned slightly asymmetrical collar construction designed to protect your neck from the full-length YKK® zipper and large mesh side and shoulder panels that improve breathability and fit. Carrying over from previous versions of this jersey is the Stratus+™ fabric, a two-layer fabric that actively wicks away any perspiration to keep you cool and comfortable. Stratus+ 2-layer fabric actively wicks moisture away from your skin. Mesh side and shoulder panels for improved fit and ventilation. 3 rear pockets plus a zippered key pocket with reflective accent. This was one of my first cycling jerseys. The build quality is very good. Went through the first season with no notable wear, excellent. The fit is Castelli, I bought large and I am 5-10, 170 lbs, 40 chest. Very good look, my wife's favorite. The fabric feel is good but not as soft as the Poddio Dopio, PI Elite Pursuit, Twin 6. All in all this is a solid jersey, well made, good looking, and comfortable enough. I would buy another. Road cyclist. 6' and 180 lbs. fits very well and is very comfortable. I did not feel bound by it. It looks crisp and classic. I am in love with prologo Jerseys. Castelli Prologo Jerseys are my go to jerseys for local group ride and more. Very aero, visibility is awesome and you get noticed. I have one that I been wearing for over two years and it still looks and feel the same way. Even though I am in New York they were delivered very fast and the price was unbeatable. I'm in my late 50's and out side of the occasional century, I ride for fitness and weight control. As cool as those form fitting jerseys look on the Tour de France riders, it's not necessarily my style. The Castelli Prologo is just loose enough to feel good and on a long ride, comfort is everything! My perfect jersey! I am an avid road cyclist. I bought the jersey one size larger than normal and it fits great. First castelli purchase. The material and workmanship are of the highest level. Definitely would recommend. My favorite jersey. Nice style without being too flashy. A little tight around the arms. Order one size up. They run small. This is a great quality jersey for the price. I tend to have to buy the largest sizes in Castelli products and found that the 2XL fits me perfectly. Slightly loose and very comfortable. The length is also good both in the front and the back. I really like this jersey. I own 3 of these jerseys because I like them so well. The fit is somewhat relaxed compared to the typical Castelli race fit. I wear a large on my 160 68 frame. There are some nice features like the extra zippered pocket and the mesh vent fabric in armpit area and strip across the back. I bought 4 new Castelli Jerseys this season. Different styles. All the same size. This one fit the best. And it feels great. nice for cool evening rides.I like the color for visibility.Fit was good. I really like the look and feel. I got the large based on reviews and glad I did. I am usually medium but this fits a little snug. I am 5' 10, 160lb. The red is brilliant and the graphics are cool and understated. The jersey is light and good in the very hot Florida summer. The torso and waist section is a bit loose but I think the medium would be too tight for me in the shoulders. The material breathes well and super light. Overall great jersey! 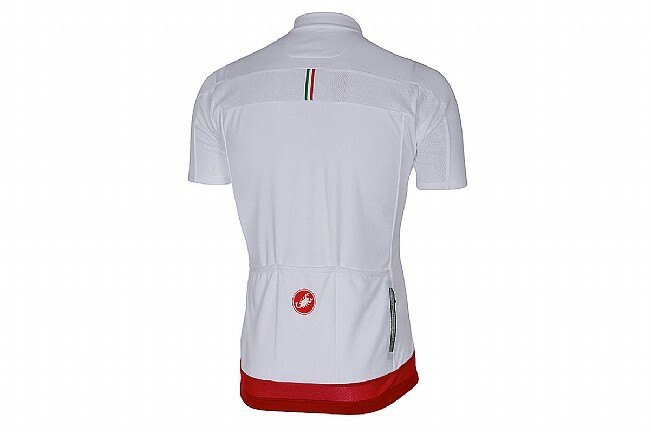 Excellent jersey for summer time riding, stretchable material does hinder your movement while riding. Very comfortable and breathable.